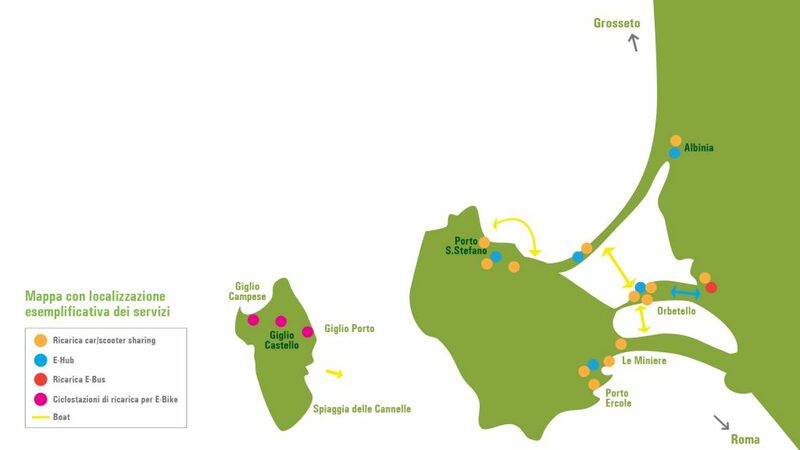 A revolutionary system of sustainable mobility will interest, in the next few years, Isola del Giglio, Monte Argentario and Orbetello. These three municipalities, for the first time along with the citizens and those operating upon that territory, will implement an innovative plan aiming at creating a system of alternative and environmentally friendly transport. The European Commission has approved the financing for the implementation of the pilot project “Life for Silver Coast”(LSC). The project, with an estimated cost of over 5 million euro, is based on the use of exclusively electrical vehicles that will make areas which are not currently reached by public transport, accessible especially to tourists. New vessels will take passengers by sea and inside the lagoon: two will connect Orbetello to the beaches of Giannella and Feniglia, two will connect the coasts of Argentario and Giglio; a shuttle service, moreover, will go backwards and forwards between the railway station in Orbetello and the centre of the towns. City cars, electric scooters and e-Bikes will also be available for users in strategic points of the territory. In order to use these vehicles the users will have the prototype “Electric Hub 360”, an innovative bike sharing station with photovoltaic panels which will enclose inside its cylinder the vehicles with pedal assistance, protecting them from bad weather and from vandalism. The whole vehicle range will be provided with an intelligent recharging system, which will be able to satisfy the needs of lighter and heavier vehicles, by using rapid supply solutions both by land and by water. Some electric vehicles, particularly vessels, will be able to use innovative accumulation systems, which are very powerful and lasting. The batteries may also be fitted into stand-alone recharging points. The elements will communicate with each other through an info-mobility platform, a virtual place providing managers and users with information, allowing for the purchase of the tickets to use the services and allowing for the users to leave comments, photos and ideas concerning the new vehicles. The whole inter-modal mobility system will also be provided with a network of fixed and movable sensors for the gathering of environmental data, in order to assess the health state of the territory and the improvements achieved. The project aims at making the citizens and the local operators the protagonists who, knowing the values and peculiarities of the territory, are summoned to intervene with advice and comments for a better outcome of the offered services. Life for Silver Coast, thanks to the advice and proposals of experts and users, will be fully operative in the summer of 2019. The system includes a testing stage of about two years, at the end of which this service will be fully implemented and part of the local public transport. Apart from the involved municipalities, the project will involve the participation of companies such as EnelX, Green Action, Newave Italia, Primordial, UNeed.IT and of institutions and research organizations which are active in the sector of transport and mobility, such as the Università di Firenze and the Polo Mobilità Sostenibile (POMOS) of the Dipartimento di Ingegneria dell’Informazione, Elettronica e Telecomunicazioni (DIET) of the “Sapienza” Università di Roma, coordinator of the project.